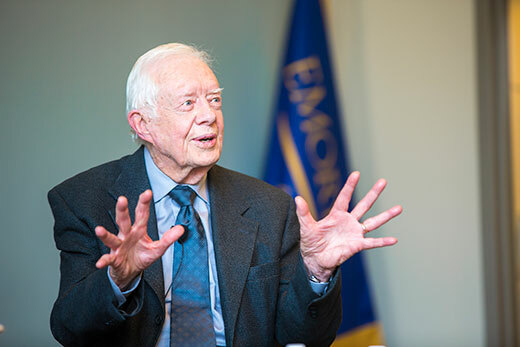 Jimmy Carter, Emory University Distinguished Professor and 39th president of the United States, will discuss "Human Rights in Today's World" for the Centennial David J. Bederman Lecture at Emory University School of Law. The lecture, presented by Emory’s Center for International and Comparative Law, will be held Thursday, April 6, at 2:45 p.m. in Glenn Memorial Auditorium. The symposium is free and open to the public, but attendees must register online. The annual David J. Bederman Lecture at Emory Law was established to honor Bederman’s extraordinary record of scholarship, teaching and advocacy. Bederman, the K.H. Gyr Professor in Private International Law at Emory, was a noted authority on public international law, admiralty and legal history. Past Bederman lecturers include T. Alexander Aleinikoff, visiting professor of law and Huo Global Policy Initiative Research Fellow; Symeon C. Symeonides, Alex L. Parks Distinguished Chair in Law and dean emeritus; and Fatou Bensouda, prosecutor in the International Criminal Court.